The first day in the Quiver Forest was about getting my bearings in a strange, new place and letting my vision adjust to the strangely beautiful landscape there. And like the first day in any overseas trip, it was also spent largely in a foggy mental state, the result of travel fatigue and jet lag. Most of the photos from that first day were disappointing and didn’t see the light of day. May 2017, panorama from 3 vertical images, additional exposures for highlights, focal length 16mm, aperture f/8, shutter speed 15 seconds, ISO 200, tripod. By the second day, Namibia started to feel as comfortable as an old friend. The Quiver Forest was still ethereal and otherworldly, like something conjured from a child’s imagination, but it was welcoming; I no longer felt like a visitor there. Among the forest’s chimerical inhabitants, I already had favorites; trees whose unique profile against the horizon captured my attention. I found myself returning to the same trees and compositions again and again, mesmerized by their lines and colors. It wasn’t only the trees that made the place special; it was a sensory experience, and I took in all of the sounds and smells. I reminded myself often that I was walking in a field of volcanic boulders among trees that in some cases, were two or three hundred years old. The stories they could tell. The world does this here and there — spreads an ancient landscape out before us, simply to remind us of our small place in the order of things. As I walked among the quiver trees I gradually became aware that we photographers were not alone there. I didn’t notice them on the first day, but on the second day in the forest, just at sunrise, small animals — hamster-like and no bigger than kittens — emerged from underneath the rocks and began to scurry about. 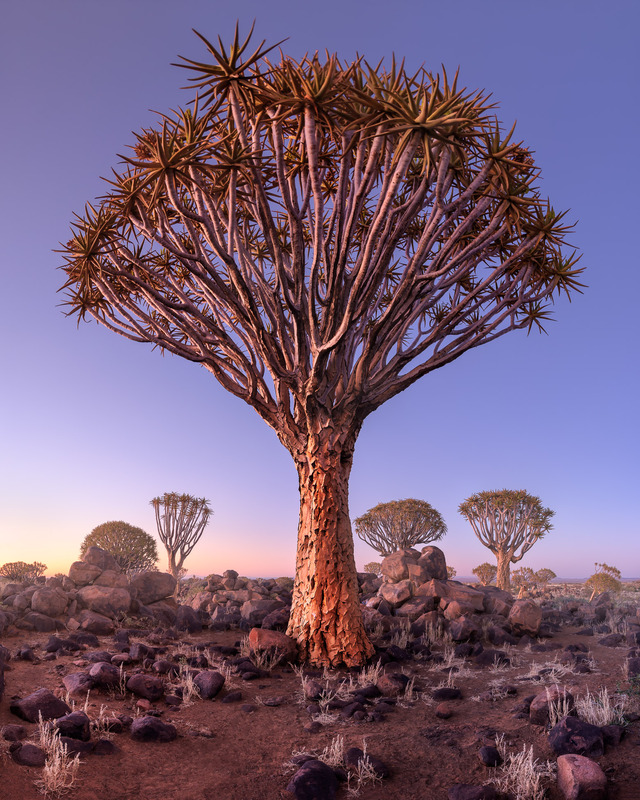 I’d never seen them before and I didn’t know what they were, but somehow, they seemed the perfect inhabitants of this place, as if the same child who imagined the quiver trees into existence filled her fanciful landscape with playful creatures who come to life with the sunrise. This entry was posted in Landscape and tagged Africa, Namibia.